You don't always need a time machine to travel back and forth through time (or space), as some seasoned time jumpers on TV have shown. But a few things remain consistent: the physical, mental and emotional toll of landing in a period (and place) completely out of sync with everything that's familiar, and the strong desire to alter any timeline for the better. With the time travel-focused DC's Legends of Tomorrow debuting on Thursday, Jan. 21, we're taking a look at some of TV’s most intriguing chrononauts. In DC Comics’ highly anticipated new series, Legends of Tomorrow, Rip Hunter’s (Arthur Darvill) travels back in time with one mission: to recruit the biggest badasses of all time to help save the world—and time itself—from annihilation by immortal villain Vandal Savage (Casper Crump). And with a time machine on his side, Rip and his motley crew of heroes and rogues, all first seen on The Flash and Arrow, eventually time travel together to stop Savage. Twelve regenerations. Twelve actors. And an itinerary that takes him from the beginning to the end of time and space itself. Since 1963, the Time Lord known only as the Doctor has traveled the TV universe alongside his companions (usually attractive young women) while saving humanity and fighting foes such as the Daleks, Cybermen, Weeping Angels and The Master (AKA Missy in more recent incarnations). Of course, he couldn’t do any of it without his trusty TARDIS. In Diana Gabaldon’s beloved romance series turned TV hit, Claire Randall Fraser (Caitriona Balfe), a former WWII combat nurse on honeymoon in Scotland with her husband Frank, comes in contact with an ancient standing stone that catapults her back in time 200 years to the same place…and into the arms of Jamie Fraser (Sam Heughan), the highlander whose barbarian charms she cannot resist. Torn between the love of two good men in two very different time periods, Claire fights to get back (well, forward) to the man she married. Only, her heart says, stay. Einstein theorized that going at a fast enough speed could lead to traveling through time and space. 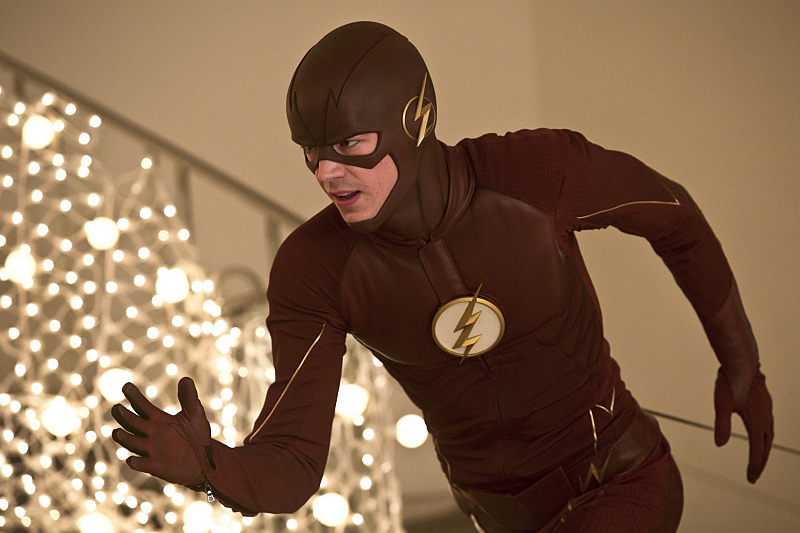 Barry Allen (Grant Gustin), the fastest man alive, manages to do just that in the show's first season when he traveled back in time. Doing so leads to a tough decision: should he go back in time again, to the day his mother was murdered, and try to save her (no matter what consequences that would cause)? In the second season, during the Flash-Arrow crossover, Barry time travels backward again when he got a second chance to take down Vandal Savage. In this small-screen adaptation of the 1995 movie Twelve Monkeys, James Cole (Aaron Stanford) has grown up in a world ravaged by a deadly plague. Humanity’s only hope is for him to "splinter" in time (via a special serum and machine) to right the wrongs that caused the world's destruction. The trouble is finding, and changing, the exact moments that set off a negative chain of events. Despite his heroic efforts, Cole has trouble altering the future for the better, and each journey through time (to and from 2043) takes a toll on his health…as well as the time stream. Ichabod Crane (Tom Mison) had plenty to deal with during the Revolutionary War, but waking up centuries later (in a very well-preserved state) to a world where muskets have been replaced with automatic weapons and women have gone from corsets to cop uniforms is a pretty big change. Fortunately, current FBI agent and fellow Witness Abbie Mills (Nicole Beharie) shows him the ropes of modern life. Yet neither of them could have dreamed that Abbie herself would eventually use a magic spell to travel back in time to stop the Headless Horseman and Katrina (Katia Winter) from killing the 1781 version of Crane. Plus: Will Sleepy Hollow Return for Season 4? In this classic '90s show, physicist Sam Beckett (Scott Bacula) was the ultimate quick thinker. After an experiment went haywire, he catapulted through time, waking up with a new face—and with a new mission—in every episode. With helpful hints from a hologram called the Observer (a cigar-chomping Dean Stockwell), Beckett used a Quantum Leap Accelerator to jump from case to case, and body to body, to correct mistakes that jeopardized history and improvise help to those whose lives he inhabited. A cop from a future where technology does all the heavy lifting is suddenly thrust back in time to a world where she’s only got her instincts to trust. Kiera Cameron (Rachel Nichols), who left her husband and young child in 2077, becomes trapped in present-day Vancouver with a group of fanatics who call themselves Liber8. The terrorists want to change the future… which means she could lose everyone she’s ever loved. Of course, she’ll do whatever it takes to stop them, even if it means teaming up with the very genius whose tech corporation made the future such a dangerous place. With a universe as vast as ours, one is bound to run into some strange phenomena—including, apparently, oneself! The crew of Star Trek (as well as spinoffs The Next Generation, Voyager, Enterprise, and Deep Space Nine­), ran into earlier versions of themselves several times. Whether through temporal vortexes, wormholes or slingshot effects (or the power of Q, in The Next Generation), time travel was a staple of this beloved franchise, even if the prime directive was not to alter anyone’s destiny. Well, it’s more of a suggestion than a directive, right? The Cartoon Network’s groundbreaking animated series sees evil wizard named Aku sending a young prince and samurai, who's eventually called "Jack," hurtling forward in time. There, Jack finds a wildly futuristic world controlled by the shape-shifting wizard’s evil. But with his magical katana, Jack fights toward a time portal to return to the past and reverse the wizard’s destruction. When machines rise up, human beings don’t stand a chance… unless they can prevent the takeover from happening in the first place. The Sarah Connor Chronicles took up where the movie Terminator 2 left off, focusing on Sarah’s (Lena Headey) efforts to keep her son, John (Thomas Dekker), from being killed by Skynet agents sent back in time, including the T-888 Cromartie (Garet Dillahunt). In order to give her son a fighting chance, Sarah and John time travel to 2007 (from 1999), with another Terminator, a T-800 named Cameron (Summer Glau), who has also been sent back from the future to protect—not kill—John. Alternate realities and time paradoxes were the norm in creator J.J. Abrams’s hit series Fringe. Father and son Walter and Peter Bishop (John Noble and Joshua Jackson) were no strangers to weird science, but the Season 2 episode “White Tulip” took things to a whole new level when scientist Alistair Peck (Peter Weller) managed to create a time machine—in his own body (hence the crazy-looking “scars”)—to save his beloved wife from death. Problem was, too many others had to die to achieve his goal…. While many shows featured characters going back in time, few ventured quite as far back in time as the UK cast of ITV’s Primeval. When inexplicable anomalies started opening portals in the past, what came out to terrorize Britain were fearsome primordial monsters. Professor Nick Cutter (Douglas Henshall) and his team were tasked with the challenge of capturing the fierce beasts during different time periods, but the mystery of his wife’s disappearance into the temporal rips was actually the greater challenge to solve.